We're rolling out Jobs on Stack Overflow. Big thanks to the folks who tested early and reported bugs here on Meta Stack Overflow with the jobs tag - keep up the good work! In 2009 Stack Overflow embarked on a mission to get programmers jobs they love. We started by bringing in the Joel on Software job board. Then we added CVs to help you show off your awesome skills, and companies started coming to you. 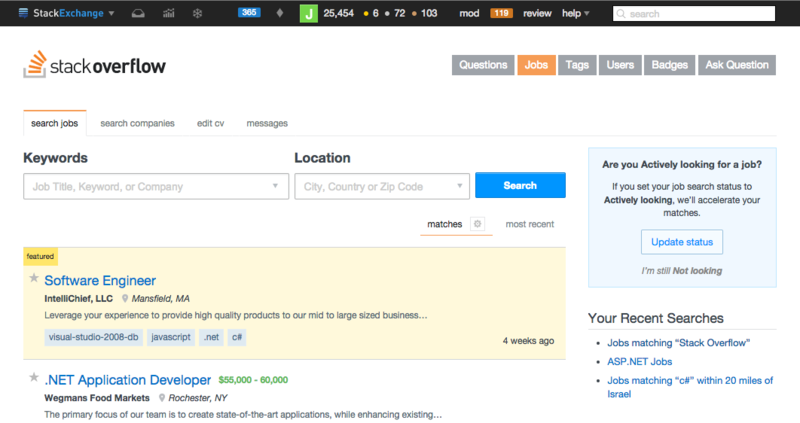 In 2011 we launched Careers 2.0 with free access for job-seekers, better CVs, and much better employer search. Company Pages came in 2013 to help companies show off their awesome. At the beginning of this year our Job Ads got much smarter with targeting. If you can't tell, we're fanatically obsessed with seeing this mission through. This isn't a side quest for us. Many of you reading this have great jobs that you love, but many more do not, and don't realize that Stack Overflow has a product that could help get them a much better job. Some might have poked at it, but got lost in the hassle of having to sign up all over again and tell us things they thought we already knew about them. We did all this work on Careers and Careers is working, but we've thrown it in the guest bedroom closet, shut the door, pushed a desk in front of it, and tied a mean looking dog to the desk. You had to go to a whole separate site and create a whole 'nother account. We made you dance the get-a-careers-invite-from-who-knows-where-boogie before we'd grace you with a CV. If you couldn't get an invite from a friend/colleague, you might have requested an invite from us and gone into a queue where a Stack Overflow human would hand evaluate your request and artisanally craft an invite for you. We went out of our way to stand in yours. There's a couple data points we have to help size just how many people we could be serving better. According to the 2015 Stack Overflow Developer Survey only 1 in 3 respondents said "I love my job". In addition to that, we did an experiment this year asking users how interested they are in jobs as they're signing up for Stack Overflow. About 60% of people filled out that job interest field and about 60% of those people indicated they're actively looking for a job or are open to being contacted about a new position. In total about 40% of people who sign up for Stack Overflow are interested in jobs, right now. It's clear that a large contingent of Stack Overflow users need and are interested in jobs and we just have to stop getting in your way. Putting the candidate experience from Careers directly under the Jobs tab on Stack Overflow is the best way to do that, so that's what we're gonna do. No more guest bedroom, no more multiple accounts and sites, no more hassle. Jobs should be live for everyone now, so go check it out. If you find bugs please post your question here on Meta Stack Overflow and tag them with the jobs tag. We've already worked to create a job board experience that helps you put your best foot forward, but it'll get even better now that we have the chance to continue improving the experience with your help. What's changing about Stack Overflow? That is about the extent of the changes to existing Stack Overflow. There's nothing else changing about Q&A. We aren't going to put jobs that look like questions in the middle of a question list, or jobs that look like answers in the middle of the answers for a question, or any other dark pattern garbage. The Jobs tab will be there for you should you need it, and otherwise Stack Overflow is essentially as it was. What's on the Jobs Tab? 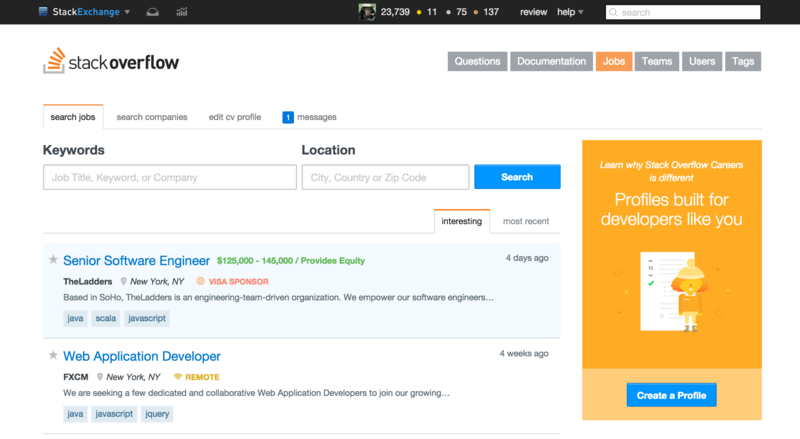 You can search jobs and companies, create/edit your CV, and read your messages right there. What about my existing Careers stuff? If you've previously linked your existing Careers CV with your Stack Overflow account, everything on the Jobs tab Should Just Work™. Are you just showing my private CV stuff to the whole world now? NO. Your private stuff remains your private stuff. What about the API and the Data Dumps? No change. There will be no Jobs or CV data in either the Stack Exchange API or the public data dumps. What about my public CV link? The Apply Button looks different on Stack Overflow? Hooo' boy. I'd like to personally apologize to you if you've interacted with our apply button in the past. It was incredibly confusing and broken and there's no justification for it. We dropped the ball. There was so much wrong there that we redesigned and rewrote the whole thing. There were obvious disadvantages to throwing StackOverflow Careers in the guest bedroom closet behind the door with a mean looking dog and a desk in front of it. But I appreciated it for one reason: it was implicit that my CV and job hunting status are not subject to the everything-you-do-is-public StackExchange philosophy unless I say so. As long as the integrated Jobs feature continues to promise the same discretion (and it looks like it does) then great! I don't have any suggestions, mind you. But I think it's jarring to see "Jobs" between "Questions" and "Tags". Please don't ever insert new buttons in the middle of an existing navbar, or reorder existing buttons within a navbar, no matter how much sense it would make in a clean-slate design. This is a general UX principle. It disrupts people's muscle memory. Don't do that. It's OK to add stuff to a navbar, but only at the ends. As someone who has never and probably will never use the Jobs/Careers feature, I would also appreciate a toggle somewhere in account preferences to make all Jobs-related UI disappear and stay disappeared. But that's much less important. Some feedback from me. I thought to give StackOverflow Careers a try a few days ago and build up the CV. What exactly am I supposed to do after I think my CV is complete ? I do not see a confirm button. The right toolbar indicates something like 67% complete. Must I enter something in every field even if it does not fit ? What I am supposed to do ? Whatever...after looking in my profile I got informed that my profile is under review. Ok, so it seems to have been saved, but I wondered why it is so confusing. Some time later I checked my spam account and found that a email verification mail got caught in the filter. I was not informed while visiting the site that you will send an email to verify the account, it was pure luck that I checked the spam folder before it got axed. Sighing I clicked the link...and was greeted with "Page not found". I must admit I finally felt...unhappy. So I wrote a message explaining the problem using the contact link in the "Page not found". I got no confirmation mail, even not in the spam. So I do not know if the message was received apart from the confirmation message. I admit I am already a bit spoiled; StackOverflow has raised a formidable bar. So far...mh. The mail text is perfect German, just the title worries me a bit: "Ihre Suchergebnisse werden ausgesetzt". You mean, you are going to maroon my search results ? They did't do anything wrong. It could have meant "stopped" if the thing destined for "aussetzen" is a verb. It could also mean 1. expose 2. skip 3. sit out 4. fail 5. intermit 6. offer (a reward), depending entirely on context, so used correctly it could be perfectly valid. Finally, the mail informs me that I am "not searching, but open for offers". This is strange because I set it to actively seeking and yes, I checked it and it still shows a different setting. Mmh. The text under my name (which incidentally cannot be edited, mh) says "bei selbstständig". "bei >name of firm<" would be correct, but "bei selbstständig" means approximately "at self-employed". And I am not "self-employed", but "job-seeking". Mh. Do you have something like a bug database...? I'm one of those odd-ball people who enjoys working as a contractor. My contracting experience is a big part of what made me who I am today. I think it would be great if we could use this features to help contractors get gigs, as well, because as far as I've seen, what's on SO Careers is 99% direct-hire. I would love to be able to make SO a tool that I can use to find gigs. I'm really happy to see you all integrating Careers with Stack Overflow proper. Well done. That said, can we expect some more love to be given to the CV generation? Prior issues I've opened in this area appear to have fallen on deaf ears. I hope the decision makers at SE agree that a well-formatted CV is important for this to all work together well. Note, from the comments - The GitHub URL issue looks like this, on PDF export. I don't know if this qualifies as a comment, or a full-on "question" over on some other meta, or what. But as it looks like this Q/A post is seeking feedback, yeah, I have some of that. The job alert thing that sends me an email with the latest jobs? Don't care for it. Don't those just fill me with excitement. ONE at least even was tangentially related to my interests--casino gaming--but it had no tags and nothing in the one-line description piqued my interest ("Job Description We are looking for an iOS/.NET developer responsible for the development and...") which is, ironically, a first. The others are even less tailored to me than my similar Monster email alert (those are at least 80% game industry, with the remaining 20% being red herrings as a result of computer intelligence being what it is: "Looking for programmer for a game-changing health care app" "Game developer looking to switch to finance" "Full stack developer needed -- Location has kitchen, game room..."). Also, it appears that the job alerts are not even editable without using the link included in the email (that is: you cannot get to the saved settings starting from http://careers.stackexchange.com or I simply cannot locate it). So this isn't an issue where I saved a bad search and get alerts on it. I saved what looked like a good search and the email blasts are pulling crap results. Can you allow us to copy our careers page to jobs or allow us to keep them in sync? CV create PDF is not nice at all or should I say it's horrible. Can't its output be like the CV print output? All appearing under Settings.